A buried cache inspires the ladies of Covington to plan an unforgettable Christmas for two families forever changed by a long-ago war. A rusty old tin box holding nineteenth-century letters and diaries is unearthed at the Covington Homestead, and the contents reveal a thrilling drama to longtime housemates Grace, Amelia, and Hannah. Two Civil War soldiers—one Union and one Confederate—were found dying on a battlefield by an old woman and nursed back to health. After the war, they chose to stay in Covington, caring for their rescuer as she grew frail . . . but they never contacted the families they had left behind. With Christmas coming, Amelia is inspired. What if she and her friends were to find the two soldiers’ descendants and invite them to Covington to meet? What better holiday gift could there be than the truth about these two heroic men and their dramatic shared fate? With little time left, the ladies spring into action to track down the men’s families . . . and to make preparations for the most memorable, most historic Covington Christmas yet. Joan Medlicott was born and raised on St. Thomas in the U.S. Virgin Islands. She lives with her husband in the mountains of North Carolina. She is the author of the Ladies of Covington series as well as several standalone novels. Visit her website at JoanMedlicott.com. 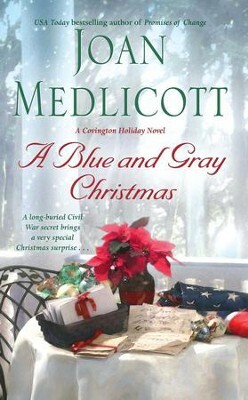 I'm the author/artist and I want to review A Blue and Gray Christmas - eBook.